Since the online poker room is available on the Chico Network, it means that it uses software created by Connective Games LLC. Of course, this piece of software has been optimized for this particular website and it keeps the style of Tiger Gaming while providing an elegant lobby that is easy to navigate. Right now, Tiger Gaming Poker is only available by download, with the promise that the instant version will be released soon. There are two versions of the casino software for Windows and for Mac OS and the hardware requirements for both of them are pretty low. This means that most computers and laptops will be able to easily run the poker room. Once installed, the lobby will show options for several poker variations and it is safe to say that most players are found seated at the Texas Hold'em tables. Omaha is also getting good traffic and Tiger Gaming has recently added 32 Card Draw, Americana and 7 Card Stud to the network. Customizable tables players can tweak how the tables look to make sure they get the visuals they like. Sleek lobby the large buttons make the gaming lobby easy to browse and there are plenty of filtering options available. Stakes cover micro and low stakes it is possible to join tables where the blinds are as small as $0.01/$0.02 or go for the upper limits of $5/$10. 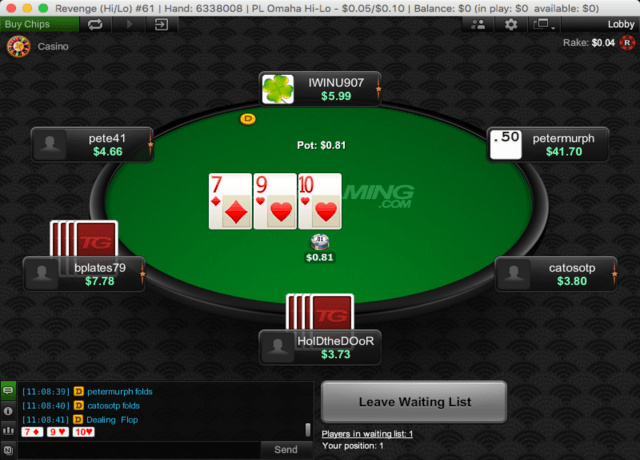 Multi-tabling several tables can be run at the same time to see more hands in the same period and thus win more. Player notes and friends take small notes on players based on how they play to have the upper hand in future encounters or make new friends on the site. 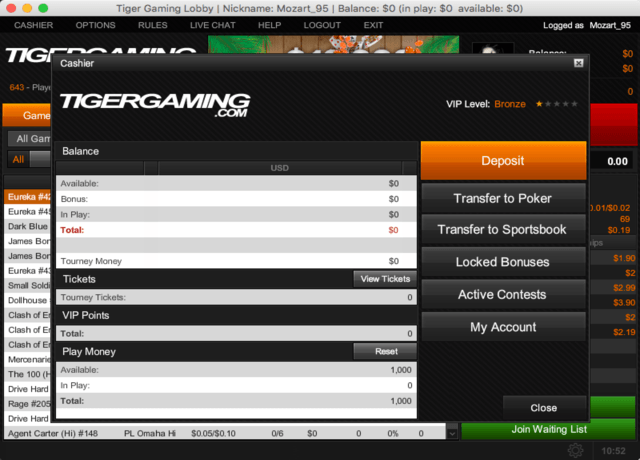 On the subject of game variety, Tiger Gaming Poker really stands out as an online card room for recreational players. The different variants available are nice but hold'em is the only one that gets good traffic and the others can make it difficult to find tables in non-peak hours. The stakes also show that casual gaming is at its finest right here and there are plenty of micro and low tables. For players from New Zealand that want to relax and enjoy the popular poker games, Tiger Gaming is very good and there is no need to worry about sharks since the stakes are kept fairly low. The tournaments also focus mostly on Texas Hold'em and some of them can go up to $20,000 for a prize pool that is worth competing for with a buy-in of $44. The smaller ones can get big fields of players and most of the guaranteed events take place during the weekends. Tiger Gaming has good software and it focuses its efforts on creating a great experience on desktop computers, with no mobile platform available right now. Sadly, compatibility is quite limited for the online poker room and this is because it does not have mobile apps and the instant play version of the website is not yet up and running. This can be a disadvantage seeing that mobile poker is huge in New Zealand but players can still sit down at a desk and get a few sessions going from Windows PC and from Mac devices. The software runs very well and it is clearly aimed at new players with clear options and guides on the website. Tiger Gaming Mobile Poker might be coming soon seeing that the software developer behind the online poker network is very experienced with betting on the move. 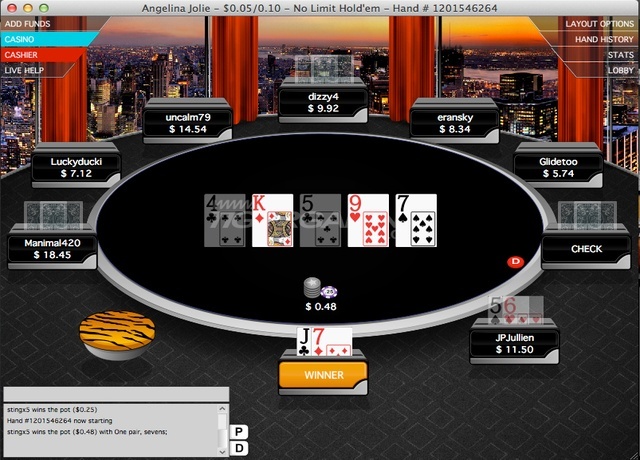 If the result is half as good as the full poker room on desktop, we can say that it was worth the wait. As mentioned before in the Tiger Gaming Poker review, the site is one of the two poker rooms on the Chico Network. Not only does this network have some of the softest competition on the internet, but it also gets good traffic around the clock and especially during European peak hours. Real money ring games get an average of over 500 players every day of the week but this number can go up to around 1,000 unique users seated at the same time. Overall, for cash games this is good traffic and tournaments also add plenty of users to the total number of active players. It is always easy to find a table to join for Texas Hold'em on low stakes at Tiger Gaming Poker and some of the customers come from the other sections provided by the operator. Having sports betting and casino games on the same site encourages players to put their skills to the test in poker and this makes for loose competition. Plenty of fish and almost no sharks make the clear waters at the poker room online perfect for all players. Tiger Gaming Poker has a dedicated customer support team that is available around the clock to take care of customers and answer all their questions. The main contact option is by email and there is no phone number listed on the site. However, it doesn’t take a long time for a reply to be offered and it is always detailed and polite. The first deposit made on the poker room online will be matched 100% with free money. In order to qualify, the payment has to be of at least $50 and it can go all the way up to $2,500. Players must send an email to bonuses@tigergaming.com with the subject NEWTG to request the bonus and the funds will be released in increments of $5 for every 1,500 comp points earned. Tiger Gaming Poker doesn’t offer a lot of information about its loyalty program and it actually keeps it very simple. Unlike other poker rooms that might have different tiers, Tiger simply offers comp points based on the amount of money contributed to rake in table games and fees in tournaments. The points can be used to get real money as a direct cashback offer that applies to all action on the poker room. The highlight of playing online poker at Tiger Gaming is the $100,000 in weekend guarantees. This is a very impressive sum for the amount of players active and experienced players can easily make it into the money. Guaranteed tournaments range from $1,000 to $20,000 during the weekend and there is even a $50,000 guaranteed event that takes place on the last Sunday of every month. With the Tiger Gaming Poker review complete, the conclusion we can draw is that this poker site is very good for casual players. It has plenty of traffic to keep the action going at stakes that cover micro, low and even a bit of mid. Although it is not available on mobile, the software is smooth and will always work great on PC and Mac. Plus, there is a huge welcome bonus on the first deposit and big tournaments to take part in to further increase the bankroll. Join now and get the exclusive 100% Bonus up to $2,500 on the first deposit! 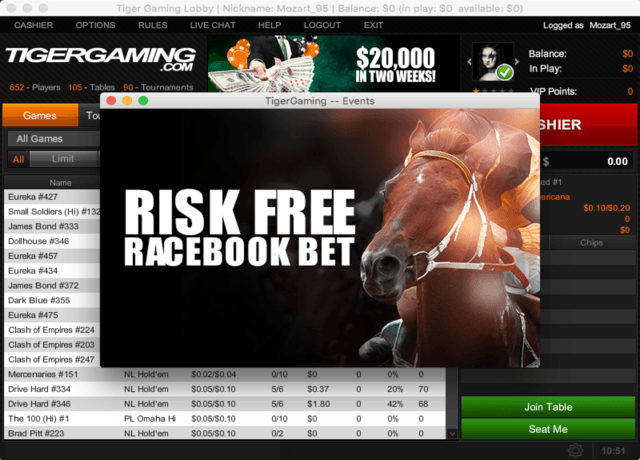 Is Tiger Gaming Poker legit? Yes, Tiger Gaming has been a trusted name for online poker since 1999 and it is licensed in Curacao. It processes transactions securely and meets all the necessary requirements for a legit poker room in today's gaming environment. The main poker variant and the one that gets the most players is Texas Hold'em, as expected. It also offers Omaha and has recently added Americana, 32 Card Draw and 7 Card Stud to the mix for more variety. Yes, you will have to download the Tiger Gaming Poker software and install it on your machine. The app is free and the site provides two download buttons: one for Windows PC and another for Mac OS computers. Sadly, they do no support mobile play right now. It is a possibility for the near future seeing how popular mobile gaming has gotten but it is not available today. Although New Zealand is a big market for Tiger Gaming, the poker room does not accept NZ Dollars at this time and instead only uses US Dollars in order to keep things as simple as they can be. It can take between one and five working days to withdraw money from the poker site. The timeframe can be smaller for some of the quicker banking methods, like Skrill and NETELLER which will usually complete in less than 48 hours. Yes, there are plenty of tournaments to take part in at Tiger Gaming Poker and these include guaranteed events with large prize pools, especially during the weekends. Big fields can gather for these tournaments and the action is intense.